The Bakery presents the exhibition ´Breaking the Silence´ by Sarah van Sonsbeeck. In her work Sarah van Sonsbeeck (Amsterdam, 1973) concentrates on defining and appropriating space. In 2008 she wrote a letter to her neighbours asking them to pay 80 % of her rent since their noise pollution took up 80 % of her living space. Since then she has occupied herself with the meaning of sound, or the absence thereof. In 2009 Van Sonsbeeck investigated silence in one of the last unplanned areas of Almere, a relatively quiet area. Walking through the area Van Sonsbeeck recorded between the 10 and 23 July (2009) the silence with a decibel meter. Graphic designers Catalogtree, made sound profiles of the decibel measurements and used the information to form a silence map: silence mapped. The most silent point of the area is captured by Van Sonsbeeck in a large glass cube of one cubic meter "One cubic meter of silence". 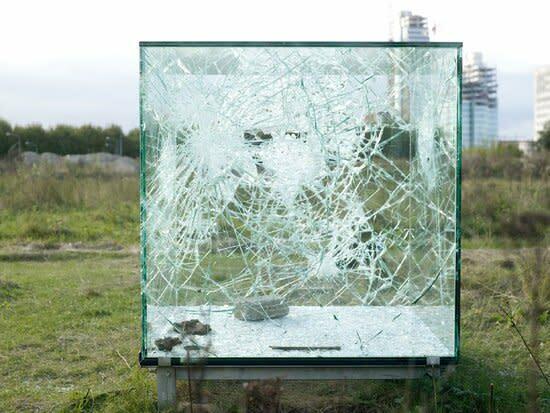 After the glass cube was damaged by vandals and the work was then again removed to her studio, it became "One cubic meter of broken silence". Van Sonsbeeck makes silence tangible.